That’s when I spotted them. 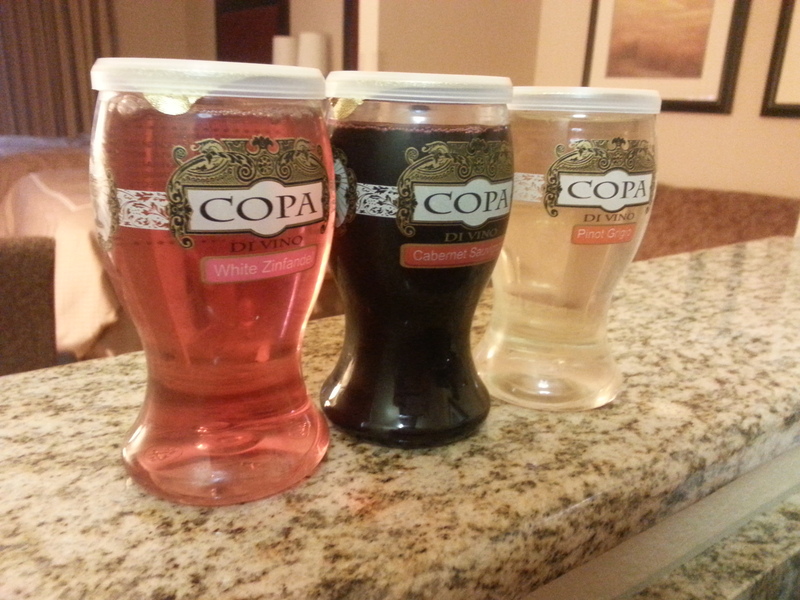 The cutest little single glasses of wine packaged in adorable little glass shaped plastic bottles. Copa Di Vino or Cup of Wine if you want the translation came in three varieties – Cabernet Sauvignon, White Zinfandel and Pinot Grigio. Perfect! Three mini glasses of wine? I think I can take care of that. The Cabernet Sauvignon had been chilled…amateurs…so I set that one out to reach a drinkable temperature and decided to start with the White Zinfandel. I peeled back the foil seal (only the classiest of wines when I’m on the road) and was smacked in the face with a sickeningly sweet aroma. I already know this is going to be too sweet for my taste. But I will not run from a wine in fear before at least giving it a chance. Yep, I was right. It tasted like what I imagine the red liquid in hummingbird feeders to taste like. That’s about as good of a description I can come up with. Sugar water with a hint of alcohol. Strike 1. Alright, round 2. Pinot Grigio. Same classy foil seal. This one smells like burnt plastic. Tastes like…I’m not even sure what it tastes like. But I can tell you it’s not good. Yeah…no…I got nothing. Strike 2. Round 3. Cabernet Sauvignon. I’m fearing the outcome of this one. Please let this one be drinkable! *fingers crossed* Alright, so far this is turning out better. It actually smells like Cabernet Sauvignon! It’s not a strong aroma but I do detect a hint of black currant. I don’t know if it’s because the other two were so terrible, but this one is actually drinkable. A light grape and raspberry flavor that finishes with a hint of black currant. I might actually finish this glass! Ball 1. Don’t let the adorable packaging fool you. Just because it’s cute doesn’t mean it’s good. This also seems to apply to my dating history… Anyway…cheers to the marketing genius that thought of putting this “wine” in cute single serve, resealable plastic glasses. Hahahahaha! I bought those at Walmart in SC!!!! I thought they were cute too. I saved the cute little plastic cups & tops and fill them with decent stuff for traveling. Works very well!